Distilled at Cooley, Ireland's only independently Irish-owned distillery, Greenore is a grain whiskey of the highest quality. Over a decade after his academic studies into the decline of Irish whiskey, ambitious Irish entrepreneur John Teeling (and other investors) bought and converted a site on the east coast of Ireland into two of the most critically acclaimed Irish distilleries operating today. Other treats from Cooley that we've enjoyed thus far on the mission can be seen HERE. See their site for more. Irish whiskey has a reputation for being lighter and "smoother" than Scottish whisky. This is partly because of the method of distillation that typically sees the Irish distill their spirits thrice while the Scots (with a few exceptions) distill only twice. It also is because Irish whiskey does not use peat to the same degree that Scotch whisky producers do. Cooley tosses out both of these Irish "laws" using peat (Connemara) and not (always) triple distilling. 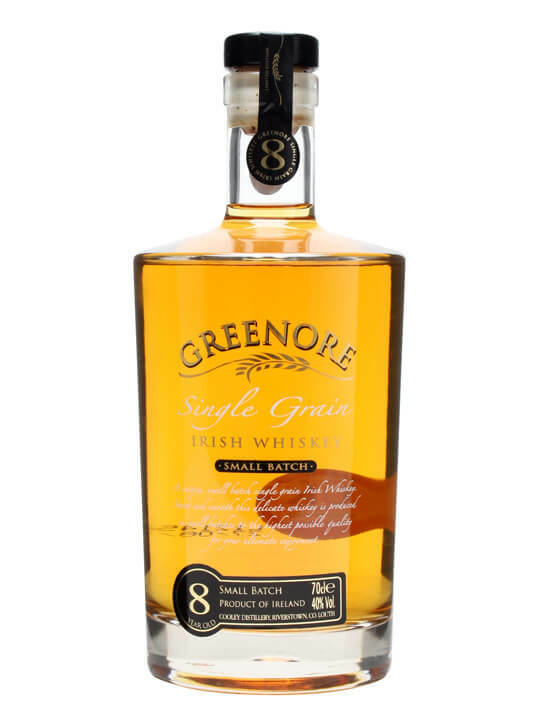 Greenore 8 year old is matured in 100% first fill ex-bourbon casks. The best casks of maturing grains are selected to become constituents in the Greenore. The rest is destined for blended whisky. This results in a limited batch of 5000 bottles with a 15 and 18yo expected over the next few years. This limited expression 8yo has already sold out in most places. Jack Teeling informs me that the 15yo will be launched in April 2008. Greenore 8yo won gold medal at the 2004 International Wine and Spirits Competition and has been enjoyed by yours truly on a sunny Sunday afternoon or two. Sweet, appetising and organic nose. Sweet with vanilla, dried banana chips, and coconut oil. Bourbon-y sweetness that gets the mouth wet in anticipation. Organic like fresh corn, green tomatoes, chlorophyll. Mmm, buttery and fruity. Toasty. Caramel. Almonds with a twist of watery lemonade. Honeyed finish with a tinge of those organic notes found on the nose. Superficial stuff first, I like the bottle design (like the Arran Anniversary shape) and the cork is fat and tight giving a nice loud sssquuueeepft when you open it. This is a light, fresh, and invigorating whisky that is perfect for a summer day. Very bourbon-y without any of the harder tannins but might be a bit sweet and cloying for some people or even for some moods. Could do well in a cocktail in place of bourbon, or even rum. Yet more evidence that great things can come from the world of grain whisk(e)y.
I know it's what's inside that counts, but that bottle really makes me want to drink that whiskey! And I'm enjoying a dram of Glengoyne 17 as I type this, so I have good things at hand.